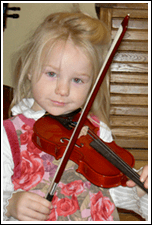 Basic Violin Rental – beginner violin with ebony fittings, a pleasing sound, wood bow, and light backpack case. $23 per month includes a $15 rental fee, $5 protection fee, and a $3 administrative fee. You may use 100% of your rental fee towards eventual purchase of an instrument. Charges are billed every three months. We require a deposit of $100, which will be returned when you decide to terminate your rental or buy your instrument, as long as your instrument has been well maintained. To begin your rental you pay $174.52 (including tax). Our rentals include everything you need to play: bow, case, rosin and music stand. Your next bill of $74.52 (including tax) will automatically be deducted three months later. Mid-level Violin Rental – step-up violin with a dark orange varnish, nice grain, ebony fittings, a bolder, more projecting sound, wood bow & light backpack case. $35 per month includes a $22.50 rental fee, a $7.50 protection fee, and a $5 administrative fee. You may use 100% of your rental fee towards eventual purchase of an instrument. Charges are billed every three months. To begin your rental you’ll pay $238.40 (including tax). Our rentals include everything you need to play: bow, case, rosin and music stand. Your next bill of $113.40 will automatically be deducted three months later. Advanced Violin Rental – advanced violin with a beautiful golden varnish, lightly flamed maple back, ebony fittings, warm, full sound, Carbon fiber bow and oblong case. $46 per month includes a $30 rental fee, $10 protection fee, and $6 administrative fee. You may use 100% of your rental fee towards eventual purchase of an instrument. Charges are billed monthly. When you sign up you are billed for the first three months. To begin your rental you’ll pay $349.04 (including tax). Our rentals include everything you need to play: bow, case, rosin and music stand. Your next bill of $49.68 will automatically be deducted three months later and then continue monthly.